The main benefit of surgery is that one can very quickly return to near normal activities apart from heavy lifting, pushing and contact sports for around 3 months. There is also less chance of bony deformity or a lump on top of the clavicle. 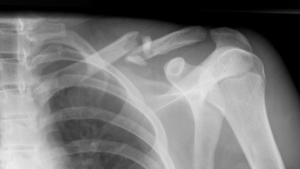 If you have broken your clavicle and want to come and see Mr Vollans for further discussion, as either as a “pay-for-yourself” patient or if you are insured please click here and then “Request an Appointment”.